Bastiaan Ekeler is the founder of Ekeler Design, and to date his professional work has been with equipment well beyond the capabilities of the Game Boy Camera. But inspired by Tim Binnion, who recently shot an F1 race on the Nintendo camera, Ekeler wanted to “get some serious glass involved”. 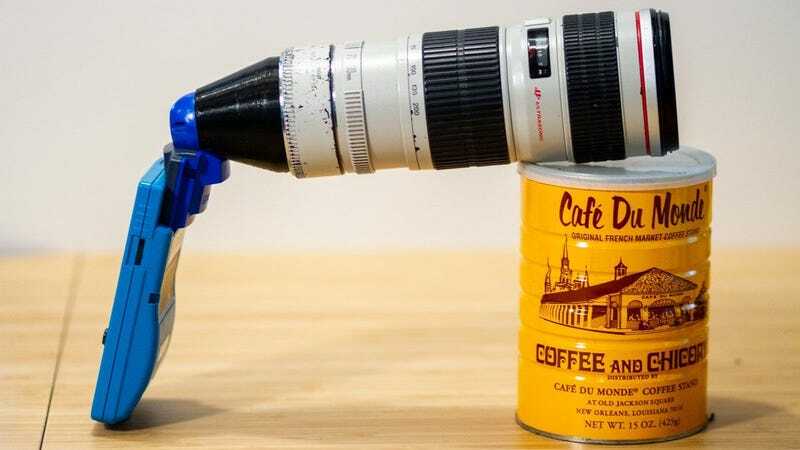 Using an available 3D printer, Ekeler designed a mount in Rhinoceros 3D that would let him attach the telescopic 70-200mm f/4 Canon L lens to the diminutive Game Boy Camera. That’s a lens worth around AUD$1500-1700, by the way. To make it fit properly, Ekeler partially took apart the GBC. “The GBC sensor PCB screws into the back of the 3D print and with a little cutting and filing, the whole things mounts onto the partly-disassembled GBC, all with the original hardware,” he wrote. “Fun fact, this combination gives me almost the exact focal length to get the moon to fill the tiny 128×112px frame,” Ekeler added. You can view the rest of the shots, as well as a comparison with an iPhone 6s to give you an idea of how intense the zoom is, here. It’s kind of staggering what people are still getting out of such limited hardware, although it does remind me of that age-old wisdom about creativity and boundaries.